Good day everyone! As Canada finally anticipates the arrival of Spring, we are making some changes here at On Spec. Our new front page illustration is by Alberta’s Corey Lansdell, who has provided illustrations for covers for us in the past. We’d love to see your opinion on the work. It will be appearing on our other social media as time goes by. And do check out Corey’s page to see what else he’s done. We are currently accepting submissions of short fiction for upcoming issues, and the deadline is March 31, 2019 to get your work to us. DO NOT EMAIL your stories. Use the Submit button on our site and follow the steps to upload your story. If you are waiting for a new issue of On Spec to show up in your mailbox, please note that we are about to send a special double issue to press, Volume 29 No’s 3 and 4 will count for subscribers as two issues, as well as having a larger cover price for retail sales. It’s packed with all sorts of fiction, non-fiction and art, and features an excerpt from a transcript of an interview with Spider Robinson. Thanks for your patience as we put this all together. On Spec is pleased to announce that we are opening a limited window for submissions of new works of short fiction. You will be able to send your stories through our Submittable link between February 15, 2019 and March 31, 2019. We have added an option for you to purchase a subscription OR a single sample copy of On Spec. Please be aware that this is not a fast-track to getting your work read or accepted. We are merely making it convenient for you to make an order if you want to see the kinds of stories we are likely to buy. We are all volunteers, and so the slush reading often takes far longer than anticipated, depending on the volume of submissions received. We thank you for your patience as we read and evaluate all your submissions. The Writers’ Trust/ McClelland & Stewart Journey Prize recognizes the year’s best short story by an emerging writer first published in a Canadian literary journal or anthology. The stories are submitted by the publishers for consideration in this prize category, and we are happy to announce that Geoff Cole’s wonderful “Two From the Field, Two From the Mill” is our selection this year. In association with the prize, any story long-listed will be published in an annual anthology, so we will all wait in anticipation of the jury’s selections later this year. As we end 2018 and look forward to a new year, there is time to contemplate the highs and lows of the past year. For us, the lows have included the loss to our writing community of such great authors and editors as Dave Duncan, Ursula K. Le Guin, Harlan Ellison, Gardner Dozois, Stan Lee, Kate Wilhelm, William Goldman, and others. We also mourned the passing of Stephen Hawking, whose contribution to the world is unparalleled. There’s good news to report as well. On Spec continues to publish in print form, thanks to our funding from the Government of Alberta’s Media Fund, as well as our generous monthly donors who sustain us through Patreon. We’d love to see our digital reach increase through online distribution of On Spec by agents such as Weightless Books for subscribers, and EBSCO for libraries and institutions. During the year, we do our best to engage with our readers by attending conventions and other events, and we love to talk with people who come by the booth to chat. While we don’t have many retail outlets, we’re thrilled to be included among the works carried by the Myth Hawker Travelling Book Store to conventions we cannot get to. I am eternally amazed and grateful for the superb volunteer efforts of the editorial team that works with me to get On Spec into the hands of our readers. They read the slush pile; select and edit the stories; proof the issues; and above all, promote On Spec with their own social media at every opportunity. If you subscribe to this blog, you are a reader, perhaps a subscriber, a friend, and definitely someone who wishes us well, and for this we thank you today and every day. Have the best 2019 you can possibly have. We will continue to work to bring our writers and readers together. Thanks for being such a great community. The leading story on the Table of Contents for On Spec Vol. 1 No 1. tells it all. “Boy at Heart”, a work of short fiction by Dave Duncan. DAVE DUNCAN lives in Calgary, Alberta. He is the author of the fantasy novels, Shadow, A Rose-Red City, and the epic and quirky Seventh Sword Trilogy. He reports that, for a change of pace, his next two books, West of January, to be released in August, and Strings, due out early next year, are both science fiction. “Boy at Heart” is his first published short story. Dave’s prolific writing career began after he retired from his first career as a petroleum geologist. He worked tirelessly, even after suffering some mild strokes in recent years, and more than 60 books bear his name on their covers. 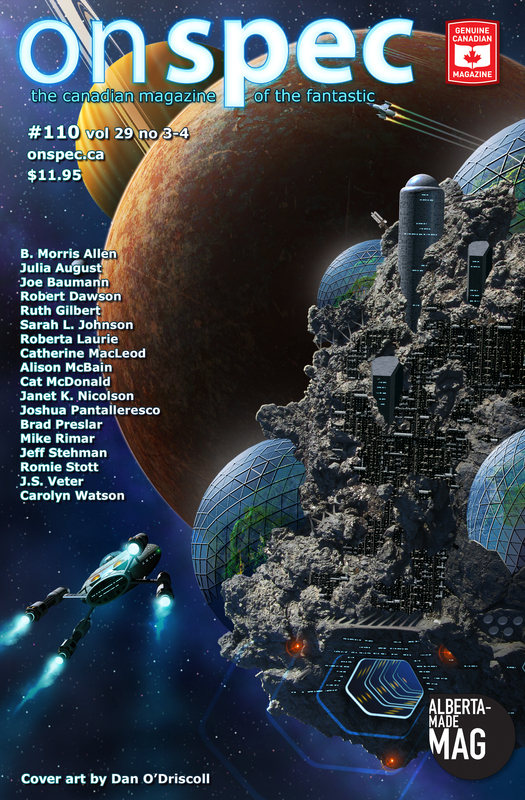 When we were thinking of starting On Spec, we put out a call to our fellow members of Canada’s SF community, asking them to take a chance on this upstart magazine by sending us a story to publish. Dave could have graciously declined the request. He was already widely-known as a novelist, not a short fiction writer. But he sent us a story, nonetheless. We will always be grateful for his trust. Since Dave’s tragic death, many of his fellow writers have written of their long friendship and professional association with Dave. He was a regular guest at regional SF conventions; he was always happy to give of his time and knowledge; he was always ready to help a writer who needed advice. Dave was probably one of the most generous souls we’ve ever known. Fare thee well, Dave. You were a fine man to call our own. Our intrepid book reviewer has sent us three new book reviews! Have a look.